Subdivisions of England (as of 2019) that have a principal local authority: two-tier non-metropolitan counties and their non-metropolitan districts; metropolitan boroughs; unitary authorities; London boroughs; and the sui generis City of London and Isles of Scilly. The subdivisions of England constitute a hierarchy of administrative divisions and non-administrative ceremonial areas. Overall, England is divided into nine regions and 48 ceremonial counties, although these have only a limited role in public policy. For the purposes of local government, the country is divided into counties, districts and parishes. In some areas, counties and districts form a two-tier administrative structure, while in others they are combined under a unitary authority. Parishes cover only part of England. The current system is the result of incremental reform which has its origins in legislation enacted in 1965 and 1972. ✪ Urban Sprawl: Which U.S. City Sprawls the Most? 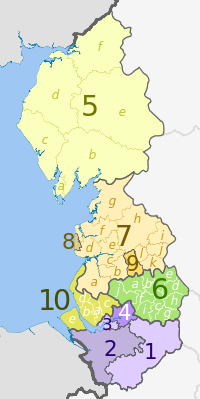 At the highest level, all of England is divided into nine regions that are each made up of a number of counties and districts. These 'government office regions' were created in 1994, and since the 1999 Euro-elections, they have been used as the European Parliament constituencies in the United Kingdom and in England's European Parliament constituencies. The regions vary greatly in their areas covered, populations and contributions to the national economy. All have the same status, except London which has substantive devolved powers. For non-administrative purposes, England is wholly divided into 48 counties, commonly known, but not named in statute, as ceremonial counties. These counties are used for the purposes of appointing Lords Lieutenant who are historically the Crown's representatives in those areas. Ceremonial counties are often different from the metropolitan and non-metropolitan counties used for local government as they include the areas covered by unitary authorities. They are taken into consideration when drawing up Parliamentary constituency boundaries. For local government, England is divided into areas with a two-tier structure of counties and districts governed by two local authorities, and unitary authority areas where there is one local authority. The arrangement varies in different parts of the country and there are four main configurations: non-metropolitan two-tier 'shire' areas, six metropolitan counties, unitary authorities, and Greater London. Most of the geographical area of England is within a two-tier non-metropolitan arrangement. In 26 of these areas the county councils provide the majority of services, including education and social services, and the 196 district councils have a more limited role. Non-metropolitan districts can additionally have the status of borough or city, although this has no effect on their powers or functions. All two-tier non-metropolitan counties are also ceremonial counties.C3 Berkshire is an anomaly in this arrangement whereby its districts are unitary authorities, but the non-metropolitan county was not formally abolished and it is also a ceremonial county. Bedfordshire and Cheshire are two former non-metropolitan counties that continue to exist only as ceremonial counties. Six large conurbations of England correspond to metropolitan counties. Each metropolitan county had a county council providing limited strategic services, such as public transport and planning, from 1974 to 1986. Despite no longer having county councils the metropolitan counties still legally exist, and are each a ceremonial county. County-level functions, such as public transport, are exercised by joint-boards and other arrangements organised by the district councils. In the metropolitan counties, the 36 district councils operate effectively as unitary authorities and provide the majority of services, including education and social services. All metropolitan districts additionally have the status of borough, and some are cities, although this has no effect on their powers or functions. From April 2011 there has been a formal upper-tier structure in Greater Manchester with the creation of the Greater Manchester Combined Authority. The Greater London administrative area created in 1965 corresponds to the London region. Through incremental change, culminating in 2000, the upper-tier authority is the Greater London Authority, comprising an elected Mayor of London and the London Assembly. Greater London is divided into 32 London boroughs, also dating from 1965, each governed by a London borough council. The ancient City of London forms a 33rd division and is governed by the City of London Corporation, a sui generis authority unlike any other in England that has largely avoided any of the reforms of local government in the 19th and 20th centuries. The City of London, and the rest of Greater London, each form a ceremonial county. The London borough councils and the City of London Corporation provide the majority of services, for example they are education authorities and co-ordinate waste management, whereas the Greater London Authority is responsible for the key strategic services of public transport, the police, economic development and emergency planning. Outside London and the metropolitan counties, some parts of England are governed by a single council, commonly called (but not named in statute) as a unitary authority. Unitary authorities are a combined non-metropolitan county and non-metropolitan district, undertaking the functions of both. Unitary authorities can additionally have the status of borough or city, although this has no effect on their powers or functions. 46 unitary authorities were created between 1995 and 1998 and nine more were created in 2009, followed by further changes in 2019, and more planned in 2020. They were formed either by non-metropolitan districts taking on county-level functions, or by counties taking on district-level functions. In some cases, borders were altered or districts were combined during this reorganisation. Berkshire is an anomaly in this arrangement whereby its districts became unitary authorities, but the non-metropolitan county was not formally abolished. For ceremonial purposes, unitary authorities are considered to be part of the county to which they formerly belonged. Politically, however, they are fully independent entities, unaffiliated with the council of their former county. For instance, the unitary authority of Plymouth is traditionally considered part of Devon, though politically it is not part of the county. In the case of Berkshire, there is no county council, as all of its former territory is now covered by six unitary authorities, unaffiliated with each other politically. Although there is no county council in Berkshire, these six unitary authorities comprise the ceremonial county of Berkshire. The Isles of Scilly are governed by a sui generis local authority called the Council of the Isles of Scilly. The authority was established in 1890 as the Isles of Scilly Rural District Council. It was renamed but otherwise unreformed by the changes in local government that occurred in 1974 in the rest of England outside Greater London. Although effectively a unitary authority, for example it is an education authority, the Isles of Scilly are part of the Cornwall ceremonial county and combine with Cornwall Council for services such as health and economic development. The civil parish is the most local unit of government in England. A parish is governed by a parish council or parish meeting, which exercises a limited number of functions that would otherwise be delivered by the local authority. There is one civil parish in Greater London (Queen's Park, in the City of Westminster), and not all of the rest of England is parished. The number of parishes and total area parished is growing. Durham 3. County Durham U.A. 7. Redcar and Cleveland U.A. Cheshire 1. Cheshire East U.A. 2. Cheshire West and Chester U.A. 9. Blackburn with Darwen U.A. 1. Berkshire † a) West Berkshire U.A., b) Reading U.A., c) Wokingham U.A., d) Bracknell Forest U.A., e) Windsor and Maidenhead U.A., f) Slough U.A. 5. Brighton & Hove U.A. 9. Isle of Wight U.A. Somerset 1. Bath and North East Somerset U.A. Gloucestershire 4. South Gloucestershire U.A. 9. Bournemouth, Christchurch and Poole U.A. Cornwall 15. Isles of Scilly sui generis U.A. 3. Telford and Wrekin U.A. East Riding of Yorkshire 5. East Riding of Yorkshire U.A. 6. Kingston upon Hull U.A. (part only) 7. North Lincolnshire U.A. 8. North East Lincolnshire U.A. ^C1 Also a ceremonial county of identical area. ^C2 Also a ceremonial county covering a larger area. ^C3 Cumbria, Hertfordshire, Norfolk, Northamptonshire, Oxfordshire, Suffolk, Surrey, Warwickshire, West Sussex and Worcestershire occupy the same area as the ceremonial county; Buckinghamshire, Cambridgeshire, Derbyshire, Devon, Dorset, East Sussex, Essex, Gloucestershire, Hampshire, Kent, Lancashire, Leicestershire, Lincolnshire, North Yorkshire, Nottinghamshire, Somerset and Staffordshire are larger for ceremonial purposes, being combined with one or more unitary authorities. ^D1 Metropolitan (36); non-metropolitan two-tier (192); unitary authority (55); London borough (32); sui generis (2). ^NC Berkshire has no county council and the districts function as unitary authorities. ^ a b c d e f Jones, B., Kavanagh, D., Moran, M. & Norton, P., Politics UK, (2004), Pearson Longman. ^ a b c "Lieutenancies Act 1997". Office of Public Sector Information. 1997. Retrieved 8 August 2010. ^ a b "The Berkshire (Structural Change) Order 1996". National Archives(legislation.gov.uk). 1996. Retrieved 13 September 2012. ^ Association of Greater Manchester Authorities (March 2010). "Greater Manchester Combined Authority Final Scheme" (PDF). agma.gov.uk. Retrieved 9 August 2010. ^ Hebbert, Michael (1998). London: More by fortune than design. John Wiley & Sons. ^ "Local Government Act 1992". Office of Public Sector Information. 1992. Retrieved 8 August 2010. ^ "Local Government Act 1972". Office of Public Sector Information. 1972. Retrieved 9 August 2010. ^ "Education and Learning". Council of the Isles of Scilly. Archived from the original on 4 June 2009. Retrieved 9 August 2010. ^ "About Us". Cornwall and Isles of Scilly Primary Care Trust. Retrieved 9 August 2010. ^ "The Cornwall and Isles of Scilly Enterprise Partnership". Cornwall Council. 30 July 2010. Retrieved 9 August 2010. ^ "Queen's Park parish council gets go-ahead". BBC News London. 29 May 2012. Retrieved 2 August 2014. Wikimedia Commons has media related to Subdivisions of England.